Intermission time in a way today kids. 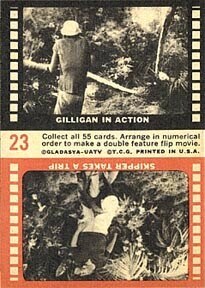 A few of the mid 60's B&W TV sets do not fully fit into the somewhat generic template Topps was working from at the time. 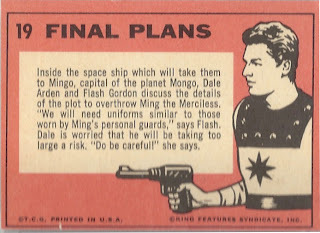 A couple of these sets share the default Topps block print with the Daniel Boone/Superman/Flash Gordon et al lineage but are not notoriously difficult or test issues. One however, is devilishly difficult. 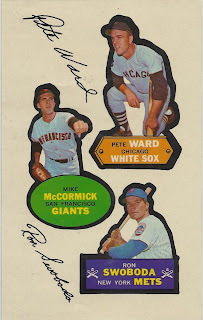 They also serve to show the big dividing line between the old and new Topps that is drawn between 1965 and 1966. 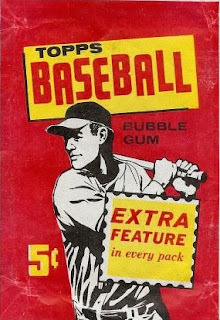 1965 is the year Topps moved its packaging and distribution to Duryea, Pennsylvania from their old Bush Terminal environs. While corporate offices would remain in Brooklyn and printing of virtually all sets was being done by Zabel Brothers of Philadelphia, the move to Duryea brought together farflung confectionery, packaging and shipping operations. Once Topps get settled in to their new digs it also seemed to free up the corporate imagination that led to a huge burst of innovative sets from 1966-71, far removed from the simple black and white TV stylings discussed in my last post. As the broadcast, cinematic and print worlds moved to color wholesale in 1966, so did Topps. You can see some some of the basic "ready made" B&W TV elements are present: the little logo and the default block print. 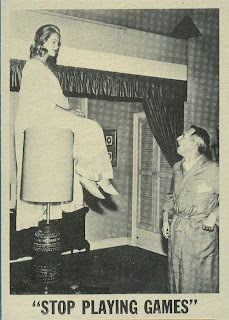 The style of the set though is very much in the You'll Die Laughing vein, where humorous captions are added to a production still. 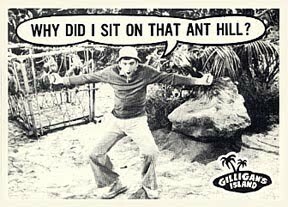 Gilligan was a full retail set, hard to find it top notch condition today due to the backs and it probably did not sell through its print run, but it was and is readily available. 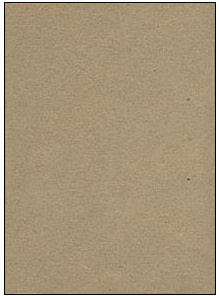 Designed to be fanned to show flip movies, these cards are often found creased in the middle today. 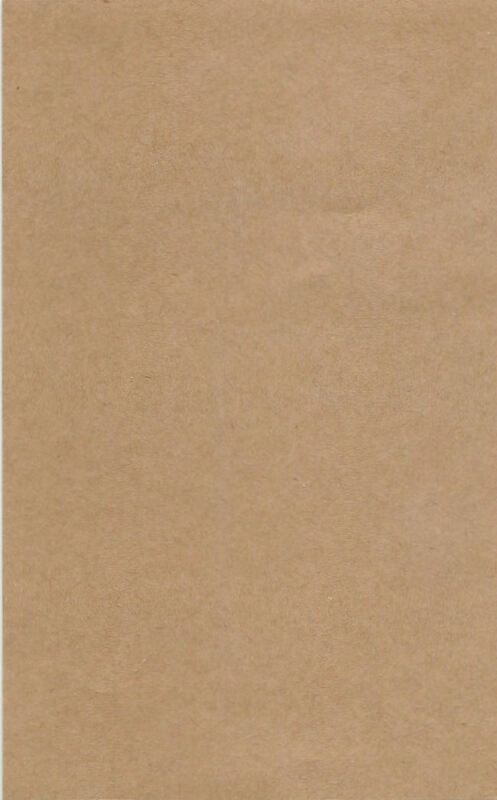 As you can see though, the back is nothing like the ready made issues. Looks like one of those lurid pulp magazine covers! 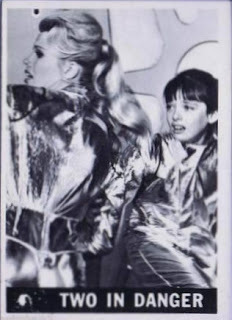 Lost In Space's first season, 1965-66 was shot and shown in black and white, it went to color thereafter. I am of two minds on this set sometimes but it seems to follow the logical progression of the B&W TV sets. The Magic Fish were "wigglies" and should be considered toys as issued; had they been inserts then they would be considered "cards" I imagine. 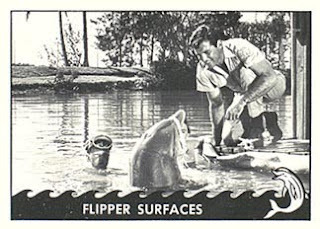 I cannot find any good scans of these elsuive fish and will save an in depth look at them (and indeed any of the sets discussed in this series of posts) at a later date. Topps was starting to face pressure from Fleer, Philadelphia Gum, Donruss and even Leaf in the TV show licensing game during the mid 60's and they turned to the tried and true gimmick of the insert card. Only the pilot episode of the show, which aired on September 18, 1965 was shot in B&W so Topps may have felt they needed a big splash of color on the Secret Agent Kits to compensate. 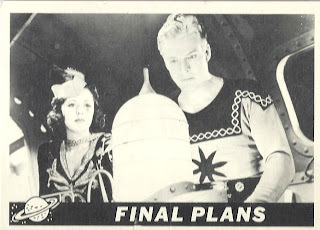 Some very strange sets remain to be looked before the decade is rounded out-stay tuned! 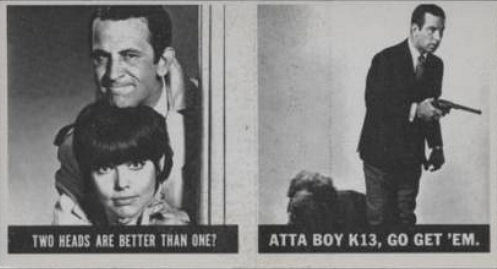 It's almost impossible to imagine it these days but prior to 1966 broadcast TV (essentially the only kind of TV back then) was not definitively shown in color. 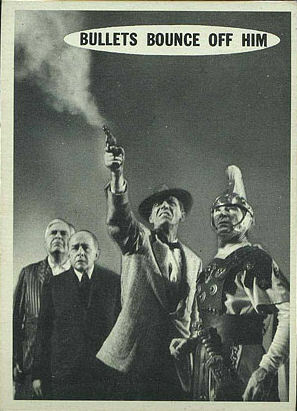 Some non-prime time shows were broadcast in color by CBS as early as 1950 but there were few sets that could decode the signal. 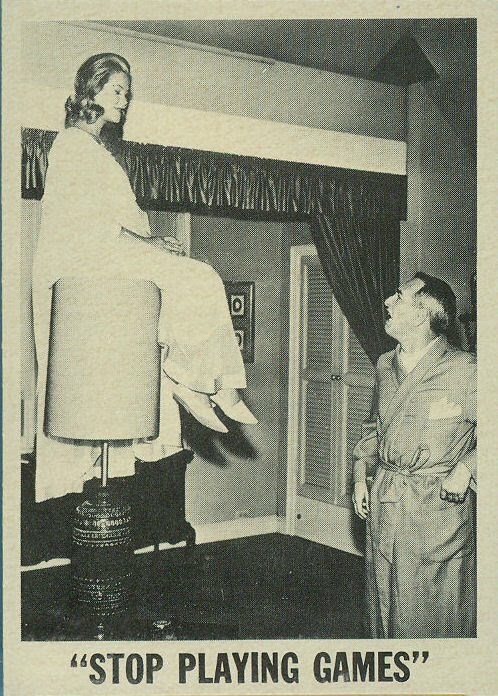 NBC made the first national color broadcast in 1954 but black and white TV was the norm until the early 1960's. Then, in 1965 NBC announced their new, fall prime time shows would all be shown in color; by the next fall all three major networks were doing so. 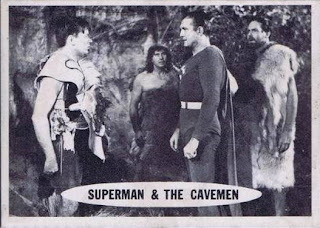 So right on the cusp of the color TV revolution, Topps started production of a series of card sets covering various TV shows (and a couple of old movies) that followed loose, unifying and slowly evolving themes, but oddly using anachronistic black and white photos. Roughly fifteen sets were issued in a five year period that to this day are not fully documented, especially as to their years of issue. Much of the confusion is due to the fact many of these sets were test, or even proof issues and suffered from minimal distribution or worse. Strangely, the fist color episode broadcast of the show was in the fall of 1965, at the start of season four. The DVD releases confirm the first three series were indeed B&W so the color cards are an oddity, especially since it is alleged they feature stills from the show. 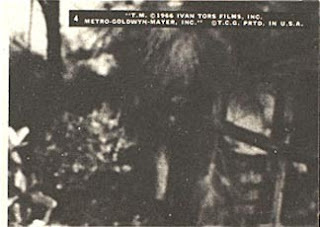 I wonder if they were instead publicity shots, done in color as they do not look like flexichromes. A real mystery, eh? 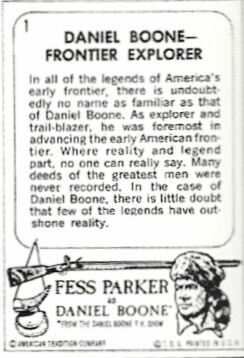 That is a rare Daniel Boone example, which may have been produced for a contest offered by NBC. The font, seemingly a natural progression from the crazy Hillbillies to the terrifying Outer Limits to the stoic Daniel Boone is quite orderly and would become a Topps staple very quickly; the fact it was issued in black and white is the other springboard for today's post. 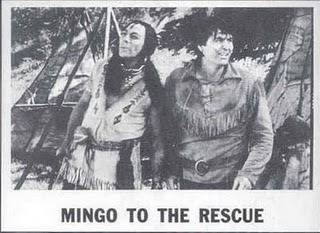 The show aired for six season but only the first, 1964-65, was in black and white. I suspect therefore the set was issued in 1964 as NBC would have run a contest early on to drum up viewership and ratings were strong from the get-go. But why revert to B&W? 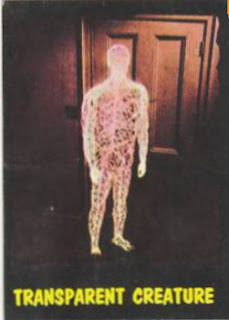 Production costs or lack of available color photography may well be the answer. Next we get to Bewtiched, which aired in B&W during both 1964-65 and 1965-66 on ABC (the last of the three majors to get onboard with color). 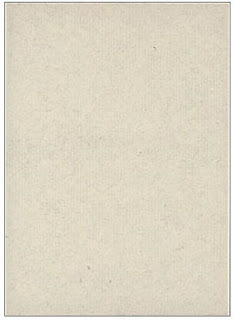 A small logo has been added here but the font remains the same. 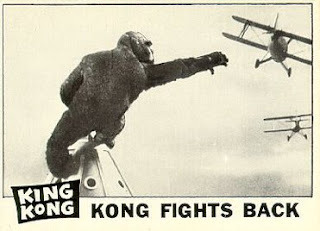 Thanks to a newfound interest in Japan, where the big gorilla was first paired with Godzilla in 1962 and thereafter the original film was broadcast so often on TV back in the 60's and 70's that is might as well have been a recurring show.Kong was as big a staple on Thanksgiving as cranberry sauce and pumpkin pie and the kiddies (and their parents) ate it up, making it a field for mining licensing gold. 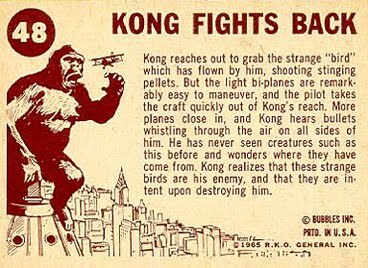 Note also how the image of the set's subject, a photo in this instance, is offset against a block of text, just like the King Kong issue. 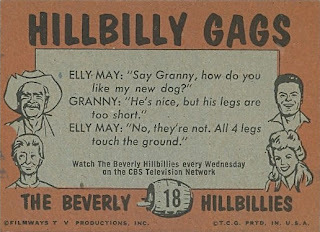 The above Superman card was a test issue; the regular issue would pull together another design element from the Beverly Hillbillies on the reverse. 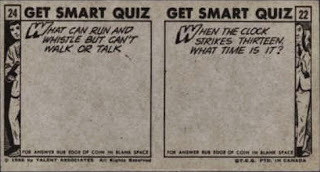 Despite the 1965 copyright from National Periodical Publications, I wonder if the "Watch Superman on TV" version of the set was actually a very early1966 issue with Topps testing the market in late '65 on the earlier and very scarce test issue. 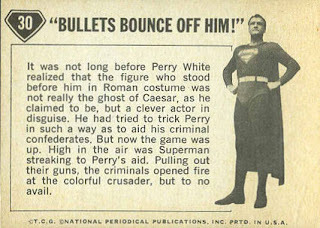 The addition of the copyright date after the test issue is just a bit odd and maybe I'm interpreting it wrong but it smacks of some legal maneuvering, very possibly to keep the actual creators of Superman from realizing any profits from the syndication of the show. Any legal wrangling could have delayed the nationally released/revised copyright set into 1966. 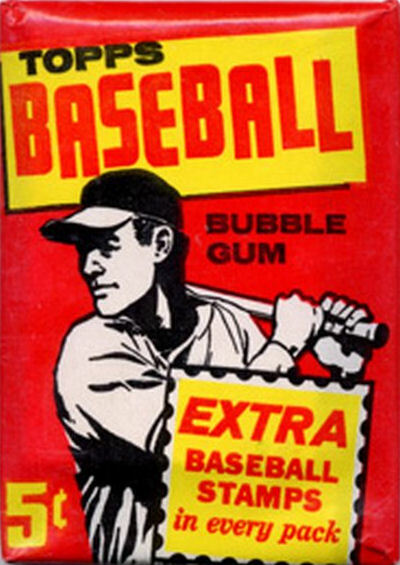 The primary back color is salmon and there can be more orange-ish hues like the Superman reverse but this color scheme was a Topps favorite in the mid-60's. Familiar font, text block and offset drawing too, no? Flash is very much tied to King Kong but I wanted to show the progression of the common design elements from King Kong through the Superman issue and then to Flash Gordon. I believe this to be a 1966 set due to the re-syndication date and the fact it shares display box design elements with the King Kong issue. It was however, likely reissued in fun packs in 1968. There is no indication the King Kong cards also made it out of Duryea in similar fashion but it is highly likely to my mind as Topps seemed to be clearing out space in the late 1968 to early 1969 period and some tough football issues were actually found in the town dump around this time! 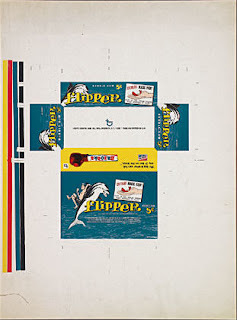 A warehouse sweep and dump into fun packs would have been very much in character at the time before the final ignominy of a set being thrown out by its maker occurred. Next time out I'll look at more similar B&W issues, so stay tuned! 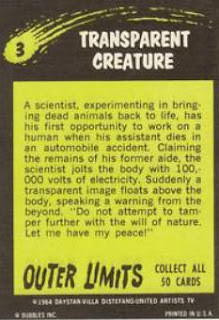 By the way, some of the scans up above were liberated from www.horrorcards.org. Go give 'em some love! If you, like me, are of a certain age, then you remember the rip-roaring adventures of Daniel Boone, broadcast every week by NBC. 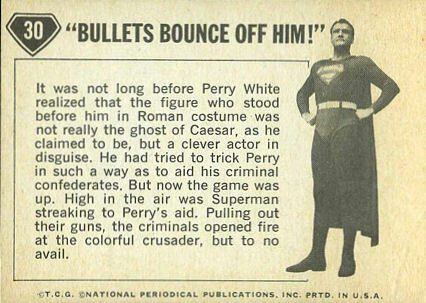 If you, like me, are obsessed with Topps test issues and minutiae, then you will find this brief anecdote fascinating. 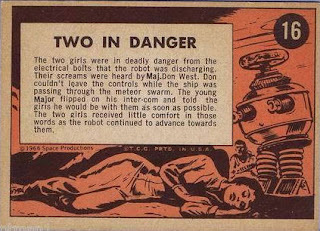 As regular readers here know, Topps produced unrelated series' of black & white cards of mid 60's TV Shows and old movies in the mid 60's. Some of these represent retail issues but a few are somewhat mysterious. One of these is Daniel Boone, which immortalized the TV show (starring that coonskin cap model, Fess Parker) and which was briefly touched upon a while back on this very blog (scroll halfway down to see in the link). 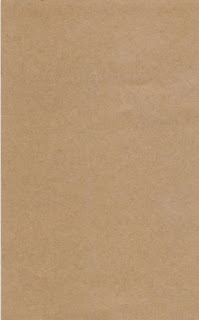 Uncut sheets have also been seen; these may have been cut up after the fact and could be the source of the blank backed cards. No wrappers have ever been seen for the issue, so an alternate method of distribution is very much possible. 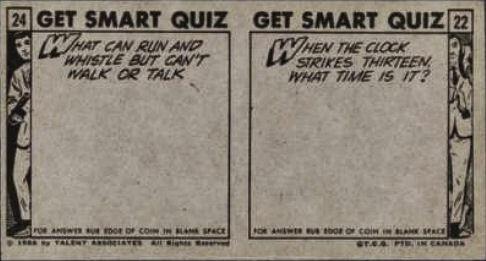 Could it be then, that these were cards designed as contest giveaways by NBC and printed by Topps in 1964? 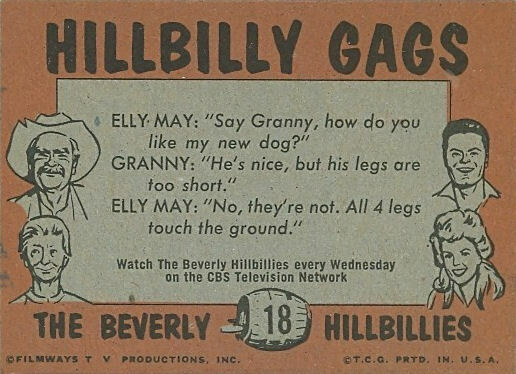 I wonder if this would apply as well to the scarce Bewitched issue, which also began a long run on TV in 1964, albeit on ABC. and also started out in black and white. 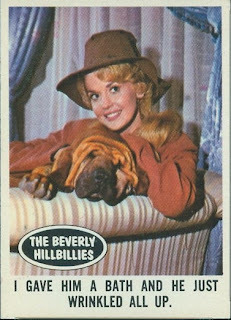 Daniel Boone was B&W only for 1964-65 while Bewitched had an additional season sans color. I think this means we can pinpoint Daniel Boone as a 1964 issue while the jury is still out on Bewitched. I hope to find out more on all of these semi-inter-related b&w issues as we move five (!) decades away from these shows. Also, here is a great TV Western site I found while researching this post, well worth wasting some time on. 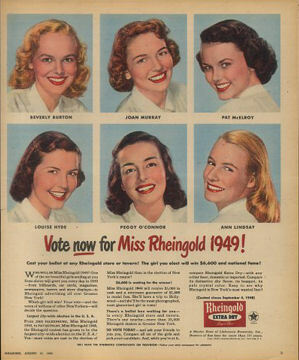 Ads for contests and pageants were often the subject of subway and bus ads back in the fab forties and fifties, not to mention the swingin' sixties. Ballots could appear in the local newspapers and maybe some magazines and of course at the counter of your favorite beverage supply shop in the case of Miss Rheingold. After some spirited voting a winner would be crowned and bestowed with a sash. I suspect the sash above comes from such an event, possibly in the sixties by the look and vibrancy of the fabric. 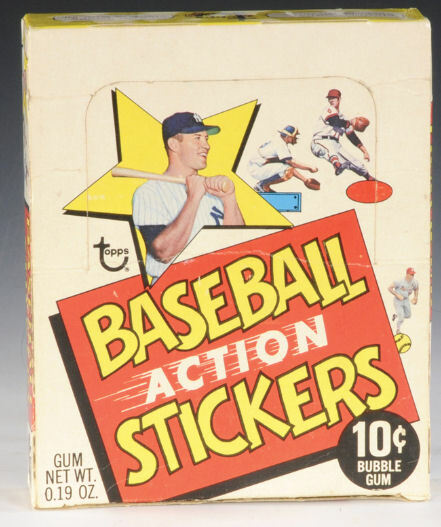 The first modern inserts in baseball packs came not from Topps but rather from their arch rival Fleer, in 1960, although the Fleer issue that contained them was not contemporary but consisted of all time greats and the like. Topps did follow suit later that year by including a series of metallic looking football stickers in the fall's football card packs (see also the the Fleer Sticker Project's overview here) but it wasn't until 1961 that they issued their first baseball insert sets. 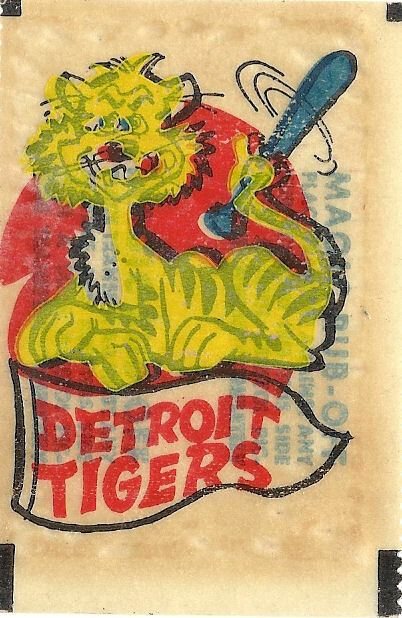 The 1960 Fleer effort (cards and inserts both) was somewhat austere and only included team logos for the sixteen extant teams that year. A year later Topps had two different inserts: an elaborate series of 208 drab stamps and a fun, colorful 36 subject ruboff insert. The stamps will be addressed here at a later date; today's quarry is the fun one. You can see the nickname of Bingo, which illustrates the main theme of the set: amusing nicknames. Of the 18 players included (one per team), all but one had a nickname inserted between his first and last name. The odd man out was Yogi Berra, who apparently was so well known by this time that his given name of Lawrence was ignored. I'll bet they could have ignored his last name too! Those little black blocks I believe were used by an optical, semi-automated cutting machine. The machine was imperfect, sometimes wildly so. The ruboffs also had 18 team-themes. Interestingly, the set is alphabetized by the first letter of the team's city and the first letter of the player's last name. Bizarre to say the least. 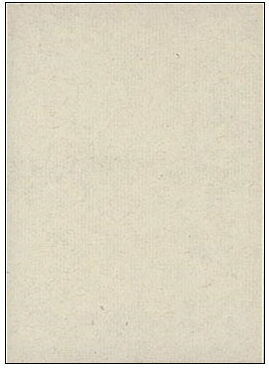 As you can see above, miscuts were common. I see however, the graceful hand of Jack Davis in some of the artwork. 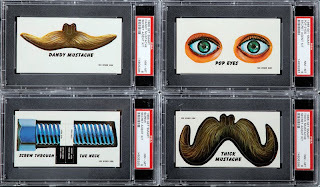 He did some projects for Topps in the 60's and the illustrations mostly look like his work to my eyes. 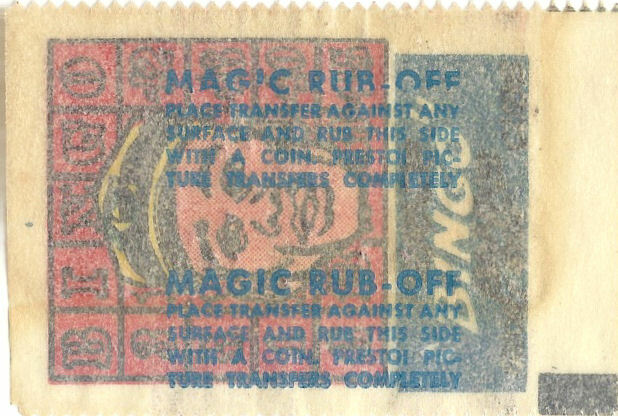 Penny packs were immune from inserts and it appears not even the cellos had an insert inside in '61. I believe the stamps were issued first based upon such a timeline in 1962, when another stamp set was issued. The ruboffs likely started around series four. They are a neat little set that, based upon what is happening to my little pieces of paper, look like they might disintegrate someday, alas! 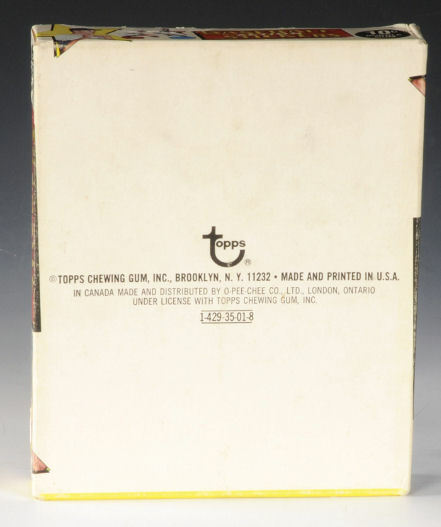 The auction detail indicates Topps Jets packs lurked within back in the day and while that is good and useful information, I was more taken in my the fact I could now legibly read the wording on the box top, to wit. Trading card collecting, like the collecting of stamps and coins, has increased tremendously. Clubs, special publications and international societies have been formed to foster further interest in this hobby. 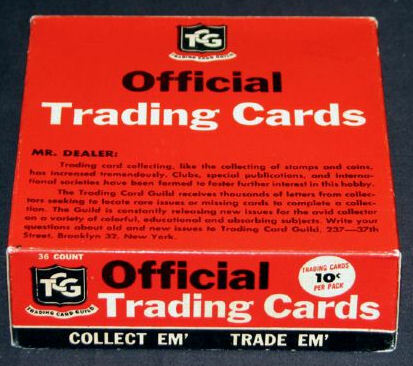 The Trading Card Guild receives thousands of letters from collectors seeking to locate rare issues or missing cards to complete a collection. 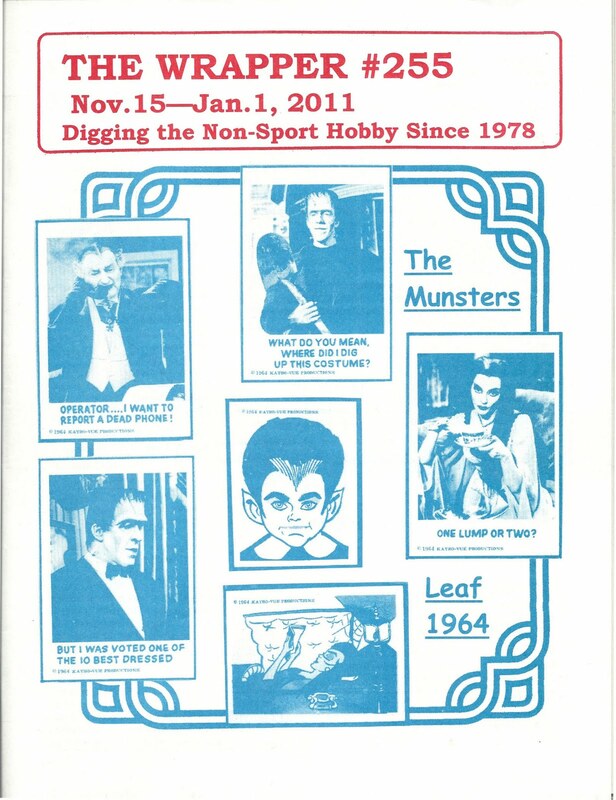 The Guild is constant releasing new issues for the avid collector on a variety of colorful, educational and absorbing subjects. 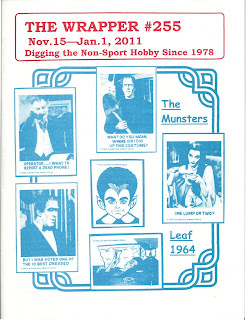 Write your questions about old an new issues to Trading Card Guild 237-37th Street, Brooklyn 32, New York. 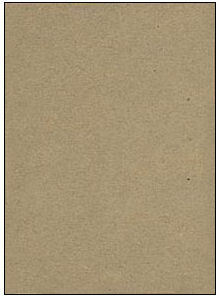 Previous posts here on the Guild have detailed the ten cent price point used for its offerings. The boxes would contain cello type clear (or mostly) packaging, although dimensions and card counts per pack would vary issue-by-issue. Since ten cents was high for the day, Topps seems to have been inviting solicitations to purchase cards from them in the wording above from more affluent purchasers. This makes sense from a logical and financial standpoint If you had dimes to spend instead of pennies, you probably had more disposable income than the penny pack crowd. Bigger packs would also be an indicator of purchases intended to complete the set. Now, the big question in all of this is: how did Topps plan to fill any orders for "odds", to use the international society vernacular, from those "thousands" of correspondents? Could this all be a precursor to Woody Gelman's Card Collector's Company? That is one intriguing question I hope to answer someday. 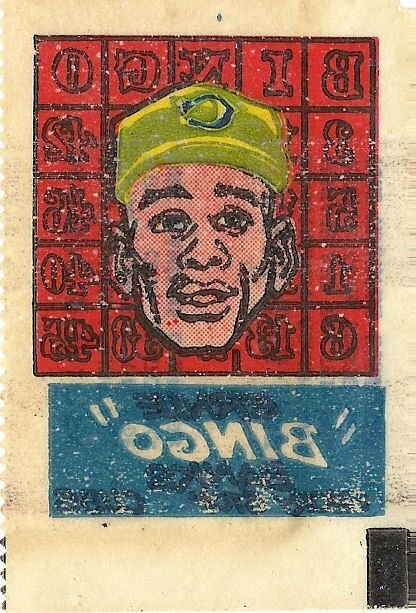 Jon has a lot of other cool scans and makes a compelling argument the football set count could be 96, which would match the number in the corresponding Baseball Tattoos from the same year. 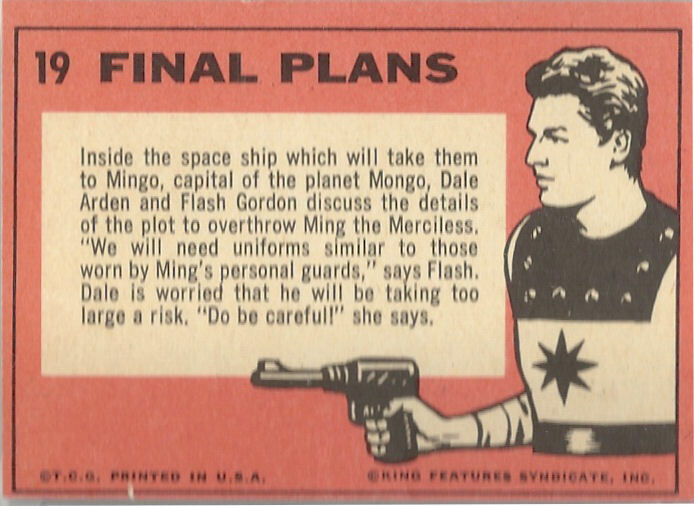 I won't rehash it here as his post is well worth a read (or two) and even better he has uncovered two proof sheet scans that have some unlisted poses and subjects but also show groupings of 32 tattoos per sheet. I think the 96 set count is likely but as with anything Topps, not with 100% conficence until the third proof sheet is found. I say this because in the 1964 Baseball Tattoos there only 79 subjects are known (or at least checklisted), including four variations and the tatoos are the same size as those from 1960 and no changes have been noted to the checklist in years. 96 slots does not always equal 96 poses with Topps but Jon's argument is sound and I suspect he is correct. 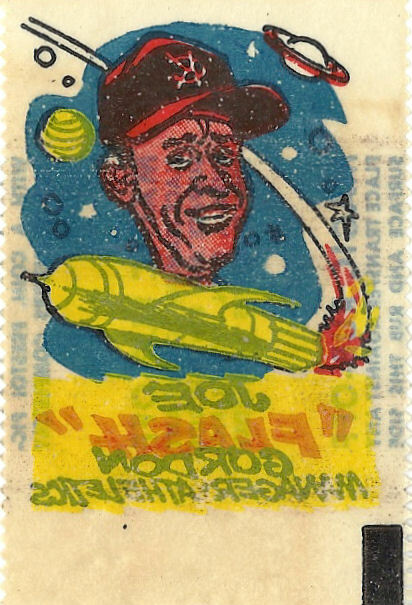 Not only was 1968 a landmark year for Topps oddball issues, it was a huge year for test issues even if you only look at baseball. 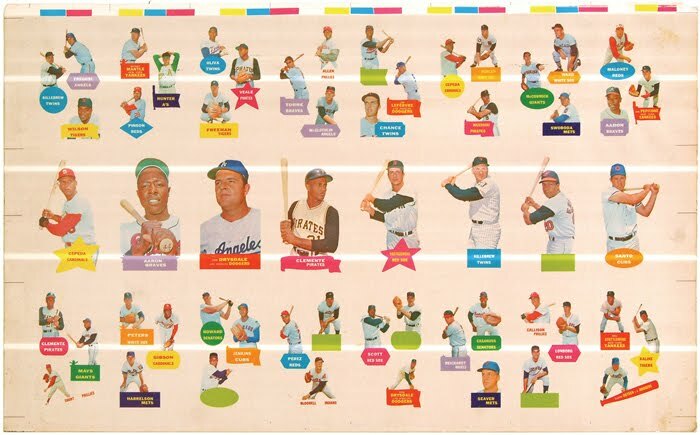 In addition to one of the best pack inserts ever, the 33 strong game cards (also a limited release of its own accord), the ultra large Player Posters and the 3-D set, there were Plaks and Discs and even leftover Punchouts. And Action Stickers Baby! 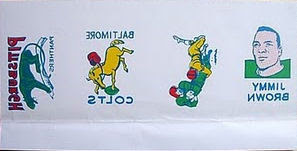 Sold in (very) long strips of three, sixteen numbered, three-paneled stickers comprise the set. 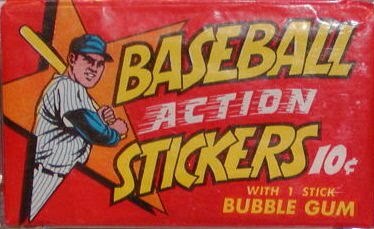 At ten cents a throw, you could have put together a set for $1.60 back in '68. Nowadays, mid four figures would be needed. 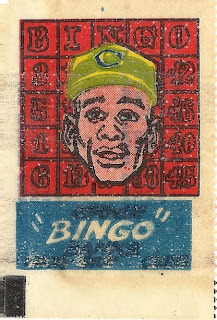 It is uncommon for a photo of a player in uniform to appear on a limited release in this era. 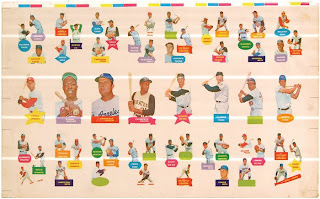 The fact that it is Mickey Mantle makes this even more of a holy grail type piece. While there are 16 three-panel stickers, only 12 are different. Stickers from #13-16 mix and match previously used panels. You can find individual panels, sometimes with one sticker missing on Ebay pretty easily but the intact strips are fairly difficult. They are not impossible though but storage and/or display would be interesting. More peeks at 1968 coming your way soon!